ongratulations, you're about to discover surprising Bible secrets that few have the chance to hear. My name is Tim McHyde. For over 20 years now, I have had an absolute passion for understanding the mysteries of the Bible, especially what Bible prophecy reveals will really happen in the future. As a result of that curiosity and persistence, I've made unbelievable progress in turning the Book of Revelation from a frustrating codebook into a understandable playbook that anyone, including you, can readily understand and use to your benefit in the troubled times ahead. Given the nature of the challenges that are coming, this information can literally save your life. Want To Know Most From Me These Days? The question I'm asked most is driven by a growing suspicion that our best days may already be behind us and a day is coming to mark "the end of the world as we know it" (TEOTWAWKI). This is the dreaded day when the good times of prosperity, freedom, stability and security that we enjoy and downright expect today are over. This generation has never seen a Great Depression, Holocaust or World War but realizes evil and danger have multiplied in the world since those days making it unreasonable to expect that history will not repeat itself. So, the question everyone seems to want to know from me is if Bible prophecy tell us what really will cause the world to unravel and more importantly, when will this happen and what do we do about it? The answer is "yes" the Bible tells us what will happen and enough clues to know when to expect it and, thankfully, also how to "escape all these things" as Jesus himself put it. Now, I'll admit it right here: this concept of TEOTWAWKI coming can be a major downer that nobody would want to believe or think about. It makes you feel hopeless to hear that the world will only get worse. If you naturally believe that there is nothing you can do about it, of course you'd rather just immediately put it out of your mind, ignore it, or go watch TV or play a video game to help you feel good about life again. But there is hope and a better approach than just ignoring the signs of the times and the handwriting on the wall, so to speak. Well, as you know... Even though many people have a computer, few have the knowledge and training they need in order to harness its full potential to make life easier. That exact same principle holds true about your understanding of Bible prophecy. Just as it takes advanced knowledge to get the most from your computer, understanding any part of the Bible takes more than just knowing how to read. There's actually a prophetic roadmap found in the Bible that must be understood first in order to properly interpret the Biblical prophecies, and eventually unlock their full meaning so you can anticipate future events just as God intended. Unfortunately, most people (including you) probably aren't even aware of this "prophetic roadmap" much less the fact that you can actually use it to improve your life! You see, almost one third of the Bible is prophecy, and much of that prophecy is unfulfilled and due to play out in this generation. While most have heard of the end time prophecies of Jesus' Second Coming and the rapture, they have little idea of what else Bible prophecy says will happen, nor are they sure of the correct sequence of events. It turns out that there are several frightening events that Bible prophecy states must happen to the Earth—before the rapture—which will affect everyone on the planet: both rich and poor, small and great, free and slave, should-have-known-better and did-know-better. In fact, the Book of Revelation (the last book of the Bible) lays out a detailed timeline of all Bible prophecy starting from when the good times we enjoy now abruptly end, up through the return of Jesus Christ, Israel's Messiah, several years later. This chronology of the end times lets us know exactly what is going to happen step by step, in order, and where to be to survive each. It reveals the future of modern nations including Israel and the United States of America and which will survive World War III and which won't (yes, the USA's fate in nuclear WWIII is on the Bible's timeline, as shocking as that is). Of course, knowing this roadmap makes you able to be much more confident about your future because it frees you from the need to obsess or worry like you used to about everything that might be coming! Once you've discovered how you can apply this roadmap, you will even be able to know from the Bible on which specific days certain major disasters will occur and for sure which years these prophesied events can and cannot happen in. (I know that's an outrageous-sounding claim, but it's true and I'll also be able to explain why you never heard this information before). Can you imagine how different planning your life would be if you were able to understand this timeline and be completely free of end times fear and on top of that be able to have more confidence and peace every day? Even Most Christians Don't Know God's Roadmap, Why? Obviously, without God, there is simply no way to know which of the threats listed above are going to happen for sure. But some will happen, probably when you least expect it. The harsh truth is that if you live long enough without properly understanding Bible prophecy, I can almost guarantee that some of these threats will cause you stress even before they later turn our world upside down—whether you are prepared for them or not. Because, we are living in the time when global calamities are prophesied to happen, and without God's revelation you just cannot know for sure which threats are coming (and when) and which ones are false red herrings (like the Y2K Millennium Bug turned out to be). Therefore, on your own you will have too many possible scenarios to plan for and not enough time to do a good job on any of them. The result is uncertainty, fear, worry, and stress, rather than the safety and confidence we could have if we know God's roadmap. How can this "roadmap" breakthrough be for real if you have never heard about it from prophecy experts, your Christian friends, or your pastor? The answer is that most Christians do not study prophecy at all. They certainly do not receive much teaching on prophecy at church from their pastors, and if they do, it's usually only one of two subjects pastors emphasize: the promise of the return of Jesus Christ or the hope of the rapture. Or they may get their information from books describing a "pre-everything-bad rapture" like Left Behind, which, let me remind you, is found in the fiction section of book stores for a reason! What about prophecy experts who do seriously study prophecy? Why don't they know about this roadmap? Because there are two major keys to making sense of the many End Times prophecies scattered throughout the Bible. And without knowing and applying these keys, even if you are expertly familiar with all the prophecies, you will still not understand them. A perfect example of this is the prophet Daniel who wrote the Book of Daniel. At the end of the book he confessed that he did not understand his own revelation, although he obviously was expertly familiar with it. When he asked specific questions about it, God told him give up as it was sealed until the End Times when only the wise would understand. Now that we are in the End Times and have the Book of Revelation and the rest of the New Testament (a major aspect of what Daniel lacked to understand his own book) we can finally understand God's prophetic roadmap—only if we put them all together wisely by using the two major keys for unlocking them. Allegorical Interpretation: The Sky's the Limit? Ever notice how none of the so-called experts seem to agree on what Bible prophecy says and also are unconvinced when someone has a bible verse that contradicts their interpretation? Why "Good Christian" = "Bad Prophecy Scholar"
Assuming these teachers are all well-meaning good Christians, why would such an unreliable approach be used? It's exactly because they are good traditional Christians that it is used! The allegorical approach arose out of a need to reconcile Biblical teaching to Greek Gnosticism as the Church was coming under criticism and persecution from Greek philosophers. The church fathers Clement and Origen advocated this approach two hundred years after Christ taught using the literal method—and the church has not been able to completely shake its negative influence ever since, especially in the field of eschatology (the study of end times). And if that's how you've come over time to perceive Bible prophecy, it's hard for you to see it any other way without help and courage to be different. Nevertheless, for the few who do correctly follow even this first rule, they usually still come to incorrect conclusions because they do not know of or follow the rest of the secret keys unlocking the prophetic roadmap. For you, it means reading the Bible is associated with frustration and an unfruitful experience that never brings you to practical understanding of what to reliably expect in the future as it should. Don't worry, because there is a set of very easy to follow natural guidelines for understanding the Bible as it was intended, bringing inspiring and helpful answers to you every time you study. So few people know about these principles, that you could easily call this one of the most simple and powerful Bible secrets. In fact, these principles are so powerful, once you discover how to apply them, you'll never feel like the Bible is frustrating or impossible to understand again. You may remember that in the late '90s we were warned that the Year 2000 computer bug could be the "End of the World As We Know It" (TEOTWAWKI). Some predicted the apocalyptic end of civilization through the breakdown of computers, power grids, communications, and most other technologies underpinning our civilization. Not everyone agreed with the dire predictions. The doomsayers and naysayers openly debated the issue, but most ignored it or did not take it seriously. However, for those Christians taking the Y2K threat seriously, it was hard to know for sure how bad things would be, if at all. In fact, even one of the best known Bible prophecy teaching ministries still out there was warning about preparing for Y2K right up until midnight December 31st, 1999. And actually even past that since they taped shows in advance that played in early January, saying "are we still here??" And, oh, how their supporters abandoned them when it turned out to be false prophesy—in effect answering the ministry with "yes, we're still here and very upset that we believed you!"). Meanwhile, there were a handful of prophecy students who knew for 100% certain that Y2K would not be an apocalyptic event. The exact same way that they could discern that the Y2K end of the world scenario would not happen, once properly understood, will enable you to discern which events will and will not happen. This includes future the blood moons tetrad's of 2014-2015, asteroid impacts and everything else you find on any website or forwarded to you by a friend (we all get lots of those emails, don't we?). Wouldn't it be great to not have to waste time worrying about any of these scenarios again (or feel foolish for believing them after nothing happens)? Discover what major prophetic event is really next (hint: it's not the rapture). Have more confidence and the "peace beyond all understanding"
...you're just moments away from discovering all the incredibly powerful principles that will enable you to do it all. All the answers have been laid out step-by-step for you below. P.S. The best part about all this is that this 'Bible prophecy secret' is completely verifiable! It doesn't require you to put your trust on me, my expertise, or take any ideas whatsoever solely on faith like typical allegory-based teachings require. Why? For example, did you know that there's a chapter in the Torah (first five books of Old Testament) which lays out the outline of events later discussed in the Book of Revelation, allowing you to assign plain meaning to the hitherto "mysterious symbols" such as the seals, trumpets and bowls? This one insight alone unlocks much of the Book of Revelation. The best part is that this Torah prophecy secret lets you quickly and easily identify which day of the year each of the remaining unfulfilled events in Revelation will happen on. In fact, I've made it my career. Why? Because I've discovered some very interesting secrets in the Bible which can make a very profound change in your life, and I can't think of anything more fulfilling to do than that. I have worked steadily for years as a computer programmer and for the majority of my career I specialized in Bible software. But in late 2002 my employer ran into cash flow problems forcing them to cut back my hours and, eventually, to completely lay me off in early 2003. Being an offshore contractor in Costa Rica since moving here in 1999, I had no other good-paying job prospects short of moving back to the United States. So I began work on other things (including a pop-up Bible utility still around called Instaverse) while I waited for them to finish a financing deal that would allow them to hire me back to work on their next version of our Bible search and library software. One of the other projects I decided to devote some time to back then was to get to the bottom of the Planet X question that had been brought up a year before by an acquaintance. He told me in 2002 that a brown dwarf tenth planet discovered and named “Planet X” by NASA (or Nibiru by the ancient Sumerians and Herculobus in South America) was due to come May 15, 2003 and devastate the planet with severe earth changes including a “pole shift” (whatever that was). Although I felt that the date of its arrival was obviously contrived, I was intrigued because the prediction reminded me of Bible prophecy. This concept of a “death star” visiting the earth and causing global disasters sounded an awful lot like what the Book of Revelation called “Star Wormwood” which is the focus of the "3rd trumpet" in Revelation 8. Yet, there was one problem. Nobody took this Star Wormwood literally because the text seems to plainly say that Wormwood would hit the Earth, a collision that would completely destroy the planet and everyone on it if it were literal. This interpretation had the additional problem of leaving nobody alive to fight the Battle of Armageddon a little later in Revelation chapter 19, thus breaking Scripture. To resolve this dilemma, the best explanation I could find in my constant studies of the Bible over the years, was that Wormwood represented not a star, but the Chernobyl nuclear reactor disaster in 1986 (Chernobyl means “bitter” in Ukrainian, just as the word wormwood signifies according to the text of Revelation explaining why it was named so). You no doubt have heard this interpretation, too. But now I was entertaining the notion that Star Wormwood was literally a star (imagine that), this (misnamed) "Planet X" which would literally disrupt all life on Earth (unpleasant as it is to imagine). Could the Book of Revelation really mean what it literally says? Even when everyone takes it on the whole very non-literally, i.e. allegorically? With the free time to go along with my natural insatiable curiosity, I finally looked into it. When I went back to Revelation to look for only literal interpretations of Wormwood that fit, I finally noticed that I had not carefully read what Revelation 8 says about the interaction between the Earth and Wormwood at the 3rd trumpet. It was not describing an inevitably 100% fatal collision at all, but a less severe kind of catastrophic interaction between the two. With the verse properly understood to no longer describe a total annihilation collision, the literal reading now fit fine, even better than allegorical ones saying it was a nuclear reactor rather than a star. To make a long story short, I found that a literal Star Wormwood perfectly fit the Planet X scenario down the line, answering my question of whether Planet X was real or a hoax (since I had of course already proven to myself that the Bible and its prophecy was a reliable source of truth and discernment in this world). But even more importantly, this discovery made plain the mystery of the other surrounding trumpets and seals (6th seal through 4th trumpet) which are the heart of the End Times roadmap contained in Revelation. I could make perfect sense of exactly what each one was literally describing now (both individually and together as a whole) with my "Wormwood = Chernobyl 1986" error finally out of the way. A roadmap of events was beginning to take shape. By the way, you may be aware that, once again, people do not even agree on how to take the seven seals, trumpets and bowls of Revelation: sequentially or in parallel. Some believe the seals, trumpets and bowls happen together in parallel, i.e. first seal with first trumpet with first bowl, then second seal, etc. Others see it happening as seven seals, followed by seven trumpets followed by seven bowls. This discovery also settled that question for good! My "A-ha" Moment & Subsequent "What If.."
If a literal explanation fits Wormwood and the seals and trumpets surrounding it, then what about the rest of the Book of Revelation? What if everything we've been told about Revelation being a symbolic book is backwards? What if Revelation is primarily a literal book (like the rest of the Bible) that uses symbolic-like descriptions which are meant to hint at where to find clues on the full meaning elsewhere in the Bible? The power of this insight was that it allowed me to look at Revelation in a brand new way, open to seeing new aspects of it and solutions to its mysteries I had not before. Wormwood, Russia Maybe... But Not Third Trumpet! From that point forward I never read the Book of Revelation as a book primarily of symbols. Yes, the symbols were still there, but they were secondary. The primary face value meaning was never again to be tossed aside for any arbitrarily assigned meaning based only on the symbolism. So, for example, the Star Wormwood would come and trouble Earth, and the name was chosen because it made the waters bitter just as it says, not because it was a symbol for a nuclear meltdown in "Wormwood", Russia. This, then, is the major secret to understanding the Bible prophecy that few prophecy experts believe or adhere to. Even the prophecy writers like Tim LaHaye who claim to interpret prophecy literally always deviate at some point into allegory in their teachings (such as in the argument for a pretrib timing of the rapture, which even several major proponents admit has no single verses that literally depict it). Frankly, I don't blame them because it's very hard to wait for that special "paradigm-shifting" information to arrive which can finally show you how the plain meaning of the words make sense. It's all-too-tempting to say "it really doesn't mean what it says, but this" just as you have seen others do and provide some halfway-plausible private interpretation of the words, especially if you don't even realize you've slipped into using allegory or typology. I've even heard prophecy experts back up their prophetic system not with Scripture only, but with dreams and visions or even personal experiences or coincidences they are convinced were divine appointments leading them to the information on which they conclude their interpretations. Obviously, this is extremely shaky ground because dreams, visions and testimonies are highly subjective. We all want to believe that God is leading us to truth in this supernatural way sometimes and we indeed all may have had valid experiences like this, but in the end, Scripture is still the final authority and if you skip checking every idea against Scripture because you blindly trust God is directly speaking you, then you may find out later that you did not give due diligence to "take heed no man deceive you," "prove all things" and "test every spirit" as we are sternly warned by Jesus, the Proverbs and by the Apostle Paul, respectively. This is a big part of gaining the discernment that we will need to resist the Antichrist and False Prophet and their mark and image. There is yet another side-benefit to this discovery. You no doubt realize that a major problem with researching Bible prophecy is nobody agrees with each other and you have no way of knowing who is right. They all make reasonable, even scholarly-sounding arguments for their interpretation. Yet you can never verify that their idea is right for yourself because it requires quantum leaps away from what the plain words say, which is all God has given us for testing whether a doctrine is true or not—plain Scripture. Once you know how to apply the rule of literal interpretation you will begin to notice which prophecy teachings deviate from it and which do not (very few, sadly) and easily conclude which may be right and which are definitely breaking scripture and wrong. So when, for example, you hear an interpretation that keeps the star as a star and it fits with all other verses also read in a manner that retains their face value meaning, then you can have good confidence you understand it properly. This gives you discernment or wisdom. But if the best interpretation you have requires a "star" to become a nuclear reactor on earth, then how can you ever prove it or have 100% confidence in it? It's twisting scripture and leaves you unable to discern or understand the Bible if you hold on to it. Do you realize the confidence and excitement that comes having this kind of discernment? You will then be able to find more interpretations like this which do not "interpret" at all, but merely explain how the plain meaning make sense without breaking scripture. Of course, after hearing my testimony it's not enough to just decide that you are going to interpret the Bible literally from now on. Sometimes you'll be stuck for years like I was, waiting for a key piece of information to arrive and illuminate a passage literally. Many Christians have come to believe that "no man knows the day or the hour" about any prophetic event in the future. In other words, they believe we are not supposed to understand it until after it happens. They therefore believe studying prophecy is a waste of time and tend to stay away from it. In other words, Christians generally understand that when Jesus said "no man knows the day or the hour" it was meant to discourage us from trying to know anything about the future, even if our reason is to be better informed for planning our lives. Believe it or not, this is the very belief that leaves a lot of Christians with a poor understanding of God's plan, too. Do you know what specific event Jesus was talking about when he said that? Have you ever noticed that he phrased that in a very odd way, "day or hour" instead of "time," or simply "day"? What about Daniel and Revelation where day counts of 1260, 1290 and 1335 days are given from one event to the next. Isn't it clear when you see the starting point event that you can count and know the day of the ending point event, as well? Why does Daniel 12 says that "the wise would understand" Daniel's prophecies (including those very day counts in the same chapter) in the time of the end—our time? When Revelation 1:1 says it is written to show God's servants what will come to pass, does that mean everything except the timings given all over the place in 42 months, 1260 days, time, times, and half a time, etc.? The solution to all of this I found was that "no man knows the day or hour" is a Hebrew idiom that was very specifically referring to a single day: the Day of Trumpets. This is one of those "difficult words of Jesus" that you have heard of but did not realize applied here. The reason the Jews referred to it as the feast of the "unknown day and hour" was because it was the only one of their holy days that came on the first day of the Biblical lunar month. Because in Jesus' day the Biblical calendar months were based strictly on the lunar cycle. 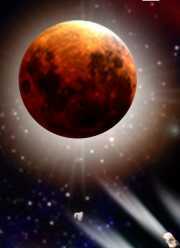 This meant a month could be either 29 or 30 days since the lunar cycle is 29.5 days long. So the month began on the evening that the first sliver of the new crescent moon became visible. Their system was to wait for two witnesses to confirm that they had seen the new moon before a new month could be declared on the 29th instead of the 30th (today they follow a pre-calculated Jewish calendar devised by Hillel II, instead). But even with today's technology we cannot predict with 100% accuracy at what day or hour the first day of the new Biblical month of the original observation-based calendar will begin. Weather and atmospheric conditions just are too variable to predict if two sets of human eyes will be able to spot that dim sliver of the new moon. Therefore the one holy day that falls on the first day of the month is still the "feast that no man knows the day and hour of." So you can see now that Jesus was not discouraging us from studying prophecy to know the dates of events in advance at all. He was actually confirming that the day of the rapture would be the Feast of Trumpets at the end of the Great Tribulation! Who are you going to believe, Jesus' plain words or prophecy teachers breaking the interpretation rules Jesus taught and adhered to? You already have an idea now what the second key is about. It is understanding the Biblical calendar and God's feast or holy days on them. If you are a typical Christian you probably do not understand how this calendar works or what the holy days are. The reason is that Christians in general are taught to focus on the New Testament and more or less ignore the Old Testament, believing it is obsolete and therefore less important. Christians are consequently left unmotivated to become familiar with the Old Testament, much less try to understand what the difficult things it says or what God was doing in the many stories it contains. (But these things we will see are prophetically important). Thus, they certainly have no understanding of God's calendar and holy days. The little they know about them comes from contact they may have had with Jewish people or Judaism. But this is not much help. For example, the world in general supposes that days like Passover are "Jewish holidays" or even "Jesus Festivals" when in reality the Bible calls them the Feasts of the LORD—God's feasts. Does this sound like a useless piece of trivia? It's not. It's actually a clue towards the central place of importance these days hold in God's plan for mankind. You see, there are eight of these festivals of the Lord (seven of which are annual sabbaths or rest days) and all of them are prophetic days which must be fulfilled for all mankind, not just the Jews. Have you ever heard that Jesus fulfilled the Passover by being sacrificed on the very day of Passover? It's true. What you may not have heard is that Jesus fulfilled another "Jewish Feast" day in his ministry as well. That other day on the prophetic calendar is the Feast of the Firstfruits. This is the day when the wave sheaf of barley was presented towards heaven by the high priest in Ancient Israel. It is always on a Sunday, seven weeks before Pentecost Sunday (Lev 23:11). As you know, right after Jesus was resurrected Mary Magdalene met him first and he warned her, "don't touch me" because he was about to ascend to "our God and Father" (John 20:17). This ascension he refered to in advance is often missed because it is overshadowed by "The Ascension" recorded in Acts 1:1-11. But there is no mistaking that he ascended that day (John 20:17) returning by that evening (John 20:19). So, if anyone back then understood that these days were prophetic and that Jesus was going to fulfill them as made possible by the presence of the Second Temple and the priesthood attending it, then they would be able to predict which day that Jesus would die and which day he would ascend to heaven. In the same way, the rest of the prophetic feast days of Leviticus 23 must be fulfilled on the very day of their celebration and the Book of Revelation makes references to these days all over the place! Jesus himself established this principle in Matthew 5:17-18 that not a jot or tittle of the Law or Torah would pass away until "all were fulfilled" and heaven and earth finally pass away, too. Paul also said that the feasts are "shadows of good things to come" (Col 2:16-17). But few have understood or applied this key until now. As you can imagine by now, all of this insider information about understanding the Book of Revelation makes a huge difference in what you get out of it when you read it. Although for years I had become used to reading Revelation and being scared and frustrated with it, now I was able to connect all the dots. The outline of the roadmap that God had hidden for the End Times become clear to me at last after roughly two decades of seeking. As I said above, it finally read like a playbook and no longer a codebook as it did for all those years. Plus my conscience was clear that I had not forced any verse to fit a preconceived rapture scenario or other doctrinal tradition for its own sake. With this framework laid out, it was easy to hang the other prophecies of the Bible off of it to fill in more of the details. The full roadmap that emerged from this took care of the feeling of being scared about what Revelation said because I now could also see what God's plan of End Times protection for his people was. As stated above, the escape plan for God's people is not a pretrib rapture since the rapture will be after the Great Tribulation according to the plain words of Jesus and a literal interpretation of the Bible. Instead, I discovered God had a plan similar to the Exodus in which he moved his people to safety. This massive and amazing undertaking involves the return of real prophets and mission of the special group of 144,000 that Revelation 7 and 14 talks about. It was very reassuring to see this plan and to realize that God does not really work in "mysterious ways" as is commonly said but he works in ways that are consistent with how he has worked in the past, based on unchanging principles and standards. These ways only seem mysterious if we have not studied the precedents of the Bible and applied them literally, rather than allegorically. I trust that by now you can see my bold claims at the top, as extraordinary as they are, are indeed reasonable after all. After doing my research, I realized that this kind of revolutionary explanation of Revelation was not available anywhere. So during the layoff mentioned above I began writing my first book called Planet X in Bible Prophecy and put it up on the Internet for free and soon after was rehired by my client and returned to writing Bible software full-time. However, I never stopped studying as a daily hobby in my spare time. I continued to make new exciting discoveries as I do to this day. (It's kind of like a jigsaw puzzle and how after you complete the outer edge and fill in much of the center, the rest of the pieces of the puzzle fall into place easily and rapidly.) While I would share these discoveries with my wife and friends, with full-time work and a family I could never find time again to sit down and write as I did when I was laid off (I'm always complaining to my wife that I'm the world's slowest writer. She says it's because I'm a perfectionist...which I won't argue with). But more than that, with the drain of our savings from the layoff I could not really justify putting that much time into my hobby when what I really needed was to find other revenue streams to help rebuild our savings as well as hopefully have something that could be a backup career ready to go in the event of another layoff. Then one weekend after fasting I came across a site online that showed me how I could take what I had already written, turn it into an eBook and market it on a website. This, then, finally gave me justification for putting time into updating my book and possibly a solution to finding a backup career, which is why, long story short, all my latest revolutionary research is now available to you. Since my research has grown and evolved since I first put it out as "Planet X in Bible Prophecy", I've decided to rename it to reflect its larger scope and potential benefit to readers. 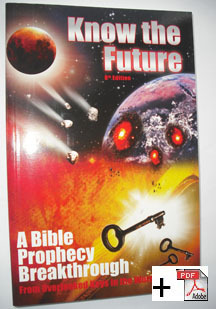 The new name of my book is: Know the Future - A Bible Prophecy Breakthrough From Overlooked Keys in the Words of Jesus. The invasion of America by a confederacy of communist nations (of course that's the only way, as no single nation could defeat the US). Even find out what God's personal name is according to the oldest Hebrew manuscripts (you might even get your "first love" with God back from this one). How the prophecies were sealed and who are the "wise" who shall understand them? This book will "literally" open up the Book of Revelation to you and show you how to apply the literal approach to reading the Book of Revelation just like the rest of the Bible (except things explicitly labeled as parables or allegories to be taken as grammar dictates). It can excite you about Bible study again because one insight leads to another through the entire Bible, as I have found ever since I wrote the book. I have several prophecy books, prophecy charts and commentaries in my library. The authors of every one of them approach prophecy with a specific rapture scenario in mind (i.e., pretrib, midtrib, or post-trib). Some commentators, unfortunately, will arrange, re-arrange, pre-arrange, twist and manipulate the various verses of Revelation to fit their basic rapture scenario. My approach is it to follow the guidelines that came straight from Jesus' mouth (as I showed you above) and let the scenario that explains all the verses literally emerge, no matter how long it takes (luckily I started 20 years ago!). So while many prophecy teachers offer to explain the same mysteries as I do here, none do so with the same strict adherence to not breaking scripture. They can't if they don't know how. They have been trained in resorting to typology or allegory or the figurative when something does not make sense to them as written. Go ahead and try as many of the teachings you can find. You probably will not appreciate the full literal approach until you have done so. I guarantee that any course you pick will at some point leave the plain sense reading and inject their own meaning separated from the plain sense of word or Bible verses. They sound good at first but, if you are like me, over time as you read the Bible over and over you eventually come to one or more verses that contradict what you had believed from that teaching and you are forced to throw it by the wayside. This story sounds unbelievable, but it's true. Not too long before writing my book, I was so seriously sick with fever that I was afraid it could all be over for the first time in my life (you know what I mean if you've been there). In desperation I did something I had never done before: I put out an email to people who I had never even met but knew from previous email exchanges were upright and would seriously pray for me if I asked (not the kind that you typically know in person who say, "we're praying for you" and then forget to do it). One of these people asked someone else she respected highly to help pray, which he did. The next day he emailed me directly about a dream he had had. It turned out that the dream portrayed the simple treatment for my condition and when I followed it I had immediate relief—with great thanks to God. I could tell from this and his humble manner that he was close to God. So, after writing my book I sent him a copy to hear his opinion of it. Subject: Re: What is Coming? ...your work is so very beneficial ...I will be directing true believers to consider it ... the only reason I am not putting a ref. to your article/book directly in my forthcoming article is that I don't want a bunch of insincere, nominal, save-their-own-neck-type-of-folks [to mess up God's escape plan for] those who are truly seeking Him [who] will be directed to your site. In other words, he was afraid of God's survival instructions getting out so plainly and being abused by those who do not merit them. Of course, since you are reading this right now, you can be glad that I clearly did not adopt his thinking and give out my website link only to people I had screened first as "true seekers." Instead, I am publishing my discovery worldwide because I trust that even if someone is at first reading it only to selfishly "save their own neck," later, after using it to survive, they will be so thankful to God for leading them to it that they will have a change of heart. Plus, there's just no way I can thwart God's plan by teaching his truth to those who are interested, whatever their motivation is. The reality is that only a fraction of the world are online and can be bothered to investigate what the Bible does say about the future when most do not even realize yet that the Bible is from God or accurate today (which everyone should diligently prove for themselves rather than just blindly trust or blindly reject). Again, I think God will lead those who are hungering and thirsting for understanding of his truth to this page. If you are reading this then you may be one of them and blessed. Some Christians are not sure at all how God is going to make it all work out, they just trust that He will. Thus, they have no position on the rapture, being aware that it's above their expertise. Either reading the Bible is too difficult for them or they just know that Jesus is coming back and that's all they care to know while they go about sharing Jesus with others. It's great that you're saved and want to save others, however, there are several other goals laid out in the Bible for us as well. The entire Bible praises the pursuit of wisdom, for example, and calls wisdom more precious than gold. The Book of Revelation describes those who rightly understand its mysteries as those having wisdom. It even pronounces a blessing on those who read the book and keep its sayings. Of course, you must read it and understand it to grab hold of that blessing. So while you do not need to know any of these things to be saved, there are blessings available now that you will lose if you do not. Besides, why would we not want to apply our minds to understanding all of God's words that he has deemed important enough to be preserved for us? I can't think of a good reason! If you are not a Christian or do not believe in the Bible, I think I understand why. It’s a confusing book whose meaning people can't seem to agree on. To observers it looks like God surely cannot be in it. This turns many people off from even bothering to try to understand it and instead relying on things they can understand and implement, like survival supplies and preparation. Know the Future is a different kind of prophecy book. It makes the Book of Revelation plain so that you can read it yourself for the first time and understand it. This is possible because it uses no interpretive tricks that require you to trust me and my own complicated explanations rather than your own command of the English language. A star is a star. Nothing could be simpler. Heavy use of Scripture references is made. This allows you to see where else in the Bible I'm basing my conclusions on. Since I'm always relying on the plain meaning of the words, you do not have to be a theologian to understand my reasoning. It's plain well-written English, not religious-speak that turns off even Bible believers like myself. “Well, I've read the entire book that I downloaded from your site, tonight. It was really interesting and clarified some things, too, for me. I think that the most wonderful thing it did, was to show me how to pronounce God's name. I think He would have forgiven me if I never learned that, but it's something nice to know. I kept repeating it, while I was reading the book, and it did give me a rather peaceful feeling and made me feel like I was forming a "connection" to Him, spiritually. His Name is beautiful. You can get instant access to all the life-changing information in Know the Future as, in addition to softcover format, it comes in the format of an eBook that downloads directly to your desktop. (When you order softcover, eBook comes with it free.) If you've never downloaded an eBook, don't worry, I am usually online, waiting to help you out. So just how much does Know the Future cost? $27. Most people spend that much money when they go out to to eat at a reasonably good restaurant. For the same price, you have the chance to discover something that may possibly change and save your life. You don't even have to decide to keep the book today. When you place your order today, all I ask is that you take the book, examine it, take a look at the powerful principles inside and try them out in your life for a couple of weeks. There are no obligations for you to keep the book. When you place your order, I'll simply send it to you to try it out, so you can give all the principles in them a "test-drive" for 60 days. That's 2 full months! If it doesn't the way I say it will below, simply contact us via e-mail and your entire investment will be returned to you immediately. And You Get 60 Days to Hold on To It! Right now, you don't even have to decide to keep the book. You can take it, and test drive the principles in it for a full 60 days, that's 2 full months! You have a full 60 day period to review the book, look it over, and apply the guidelines into your Bible reading. If they don't work just like I told you they would above, simply contact us by e-mail and I'll immediately return every single penny of your investment (softcover refund minus shipping / handling). I just want you to give these principles a try, as I am confident they will change your life, you have no obligation to keep the book if they don't. Further more, if you're unsatisfied with your purchase for any reason and you'd like it refunded, simply contact me and I'll return your entire investment. You have absolutely nothing to lose, only prophetic understanding, and more peace and confidence to gain. Just why am I willing to make that kind of guarantee? It's really simple, I believe in these principles, I have tried and tested them in my own life and I enjoy the results every single day when I study the Bible daily. Think about it, how many people do you know take serious accountability for their actions? Would a lawyer guarantee to win your case ...or...return your entire investment? Would a stock broker guarantee to make you money ...or...return your entire investment? Very few people are willing to make that kind of guarantee ...and...stand behind it. I do, because I've devoted my career, and my life, to helping people just like you create extraordinary lives all by understanding God's End Time roadmap. Why? Because I've personally been in a place in my life where my outlook about the future and motivation to study the Bible were at an all-time low (due to layoff) and I've used these principles to turn all that around. I know this works! I've experienced it. Since early 2003, thousands of people have come to this web-site, downloaded my research, and have had these same profound benefits, as you're about to experience. I simply love receiving letters from people who have used these simple methods to change their outlook on the Bible and their future. I see myself as someone giving you real, solid, updated advice on one of the greatest secrets to peace and safety...not... as someone just handing you information. Plus, because I want to absolutely over-deliver to you today, when you grab your copy of Know the Future, you will instantly receive all 4 of these special bonuses. For six months after you get the book, you can freely download updates to Know the Future that I make during that period (from my new private forum). See, unlike many prophecy experts who switch into "ministry business mode" and keep pushing the same outdated allegorical teachings they have for decades in order to support the overhead of their office and employees or lifestyle, I am still studying prophecy every day as a hobby as I always have, with no distractions. So I never stop learning and having things to share and write about, I'm just that passionate about it. My plan is to continue to expand Know the Future with new chapters and appendices to let everyone in on the latest secrets I uncover. So my book will continue to be the only accurate and only up to date prophecy book on the market. Here's my vision for the private forum: Like me, you've probably visited lots of free public Christian forums that are out there. You may have visited some of them in search of answers or community, or both. What you may have found is endless debates, and rude, obnoxious or insulting comments from anonymous strangers who are not really there to seek the truth but only to put down anyone who does not agree with their beliefs (if you have spent much time in the Paltalk Christian rooms you know exactly what I mean). So, I decided to finally start my own forum for people who really do want to seek the truth (using literal interpretation only, of course) and share their comments or questions in a constructive and kind manner, yes, even Christ-like, manner. The forum membership costs be $20 for 6 months to renew because of the book updates there. However, to get readers of my book off to a running start, I'm going to give 6 months memberships away free for everyone who orders my book to help build up the community aspect. This way all my readers will have a place to go where they can immediately post questions and get answers from me quickly and soon be able to find other serious people and hear what they have to say...in addition to the valuable book updates. My wife balked at first when I told her I wanted to give my Mystery of Disunity book away as part of this Revelation Roadmap package because it could be continued to be sold on its own. But I told her that people often do not invest in information they need for the main reasons they should but instead for some side reason. I'm offering this bonus because I know for some your curiosity about the 144,000, Elijah, the Woman and the Two Witnesses may be more motivating at first than hearing about Planet X and Wormwood. This book is liked by some even more than my first book since it is so fascinating and directly relates to the situation we face today as people seeking the truth among thousands of warring and conflicting denominations. In fact, I'm not sure I will continue to offer it as a bonus here since it really has unique unavailable literal discoveries on its own right, unlike the typical throwaway obsolete products Internet marketers offer as bonus incentives. The doomed approaches at restoring unity today and how to avoid the groups using them! Why Israel and Judah (the Two Houses) have been brought to and exiled from the Promised land three times now (soon to be exiled again) even though each time (including today) they still violate the Torah required by God for them to stay in Israel for good. ...then you will really enjoy how this book finally gives a plain literal interpretation for all of it with all the plainly-read scriptures to back it up. Just be sure to read Know the Future, too, so you can plan better for the disasters that the future is bringing in our lifetime. Like Jesus at the wedding in Cana, I've actually saved the best for last. Due to the overwhelming and encouraging response I've received since putting up this article in early July, I was encouraged to begin immediately with writing a new major update with more of my research. Finally, two months and 45 new pages later, I have now written my third prophecy book that I call the "Revelation Roadmap". This book picks up with the events after Wormwood's passage where Planet X in Bible Prophecy leaves off, using a 5 page color End Time timeline chart (with years!) (pictured at left). Among other things in this new book, you'll find out where America is in prophecy and the exact timing of her fall, thanks to the secret prophecy key of the Sabbath year cycles. Jesus must return in a Sabbath year. The (post-tribulation) Rapture therefore only happens in a Sabbath year. 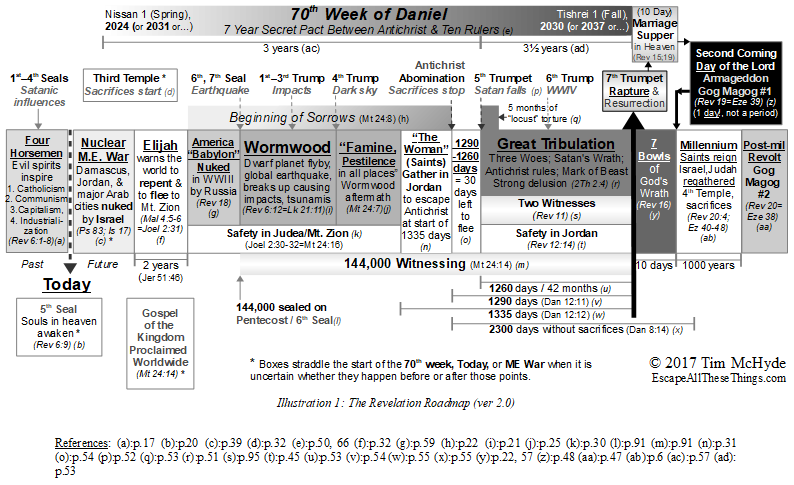 The Great Tribulation must begin in year 4, the middle year, of a Sabbath year cycle (Dan 9:27=Mt 24:15). Wormwood must come soon before that, probably in year 3 of a Sabbath year cycle. Since America falls between Wormwood's passage (year 3 of cycle) and the start of the Tribulation (year 4), the timing of the Fall of America can also easily be ruled out for several years in advance at any point in time, which is very comforting. In other words, none of these events can happen at any moment, but can each actually only happen in one out of any given set of seven years! How Daniel points to Antichrist coming from Great Britain and how to identify the Antichrist off the plain literal criteria given in Revelation. The Events of the Great Tribulation and what happens in the First Half of the 70th Week. Why the first five seals are past and how to make literal sense of every single one of them...that's right, no metaphors, no symbols, just using Bible precedents to explain the Bible. P.S. Customers with forum access can use the link in their download email to get this update for free. I know people are anxious to read the material when they order. So what I have done is included this extra bonus when you order the softcover edition. You get the eBook download link emailed to you instantly just like eBook-only orders do. This way you do not have to wait for the post office to deliver the softcover to get at this life-changing information. But I must warn you about downloading it if you need to go to bed soon. You may not be able to stop reading and get your sleep! I'm not exaggerating. I cannot tell you how many people have told me they stayed up to 3AM or even 5AM reading my book. So don't say I didn't warn you. Well, you need to Order Now. Remember, all of these bonuses together add up to $50 in value, each and every one of those bonuses is yours free when you order today. To make sure to cash in on the savings and get over $50 worth of life-changing bonuses free, you should immediately click here to fill out your order form and place your order right now. Even if you're not sure if this program is right for you, you should grab the book see how different it is from any prophecy book you've seen before. You are under no obligation to keep the book and have 60 days to try it out! If it doesn't deliver what I promised in this letter, simply contact me and you'll receive your entire investment returned to you, no questions asked.... You'll be surprised at the results you'll create in your life if you just follow half of the secrets I have to share. Know the Future is only available on this web-site, you won't find it in book stores or anywhere else. Remember you'll get INSTANT access to the Know the Future package as it comes in digital downloadable eBook format (PDF) whether you buy the eBook or softcover option. To order, simply click on the link below to fill out your order form. We accept payments by Visa, Master Card, Discovery, American Express, electronic check and PayPal. Upon completion of your order, you will be instantly forwarded to our download page where you get instructions on how to immediately download Know the Future to your desktop (and receive an email with the same download information just in case). No Credit Card? We Support Checks Online w/Paypal! choose eCheck payment option after clicking the Buy Now button above. Need a Paypal alternative? I now have SWREG, which accepts: VISA, MasterCard, American Express, Discover/Novus, Solo, Switch, JCB, Connect, Eurocard, Delta, UK and US Checks, Money Orders and Bank Wire Transfers. Click a button below to order with SWREG. Call now if you want the book but have any doubts about ordering such as whether a real sincere person is behind this page =). Or just chat in the chat box with me on the left if I am online. ...with "for deposit to account #435006751070" as the endorsement on the back of the check/MO (important!) and also with your mailing address (if you ordered softcover). if it's 2:00 AM in the morning—you'll get INSTANT access. • I believe the Bible in its original manuscripts is the inspired and inerrant Word of God (2Ti 3:15-16). • I believe Jesus is the promised Messiah who died as the sinless Lamb of God, rose from the dead, and whose blood alone takes away our sins, saves us (Rom 5:9), and enables us to come to the Father (John 14:6). Never downloaded an eBook before? Don't worry, step by step instructions are included and I am online full-time and after hours and available to help you with your download in case you have any computer questions. You can contact me at the email listed at the bottom of this page (and I am are always complimented on my very fast response times). "I Was Refunded My Money The Same Day"
I found Tim's site late one night while researching biblical prophecy and began reading. I was completely hooked and could not stop reading. I wanted to learn more but was unsure about spending good money on an E-Book, which I have never done before. I decided to try it considering Tim's satisfaction guarantee. The eBook was very interesting and I could not stop until I was finished. I did, however, find that some of the information was a bit beyond my very limited biblical knowledge and was a bit disappointed. This was my fault not Tim's. So I contacted him regarding the guarantee. He replied to me within the hour and only asked, not demanded, any input I might have and I was refunded my money the same day. This truly is a no risk endeavor. Tim is a man of his word and I highly recommend anyone give this a read. Still not sure if my eBook is for you? If you aren't ready to order, click here to contact me or use the phone # above. Or go here if you think this research, like all Bible teachings, should be free. My friend, thank you for taking the time to read this long letter, what you're about to tap into can really change your life. I'll see you on the other side! +17012054168 (Call to speak to me if you want the book but have doubts or concerns I can address such as, yes, I'm "for real" and sincere about this message). From Bible prophecy we know that it's only a matter of time before things do fall apart. Things will not continue to go on normally with prosperity, security and freedom just as they always have, forever. And once that happens this material will not be available anymore. Without a free Internet and freedom from the "mark of the beast" in commerce, and without other fragile infrastructure that we take for granted, you won't be able to get the life-saving information before Wormwood hits. 13 ...there was a great earthquake...and every mountain and island was removed from its place. The answer to that rhetorical question of "who can stand" through it, is found also in the Book of Revelation. It will be those who are properly prepared for it. Similarly, Jesus' parable of the Ten Virgins stresses the importance of being prepared for the culmination of this age. Don't let yourself be among those who were too busy with everyday distractions to prepare themselves. Be diligent now about making up for lost time, all those years you never studied prophecy seriously enough for yourself. Through no fault of your own you had teachers who did not know about the prophetic holy days or the error of allegorical interpretation, but now you can change all that. The sooner you get this information the sooner you can start understanding the End Times and cut through all of the scary stories out there to know which to pay attention to and watch. The best part is you don't even have to decide to keep the book today, you can verify the contents of the book against the Bible for a full 60 Days! (That's 2 Months). If the prophecy keys and roadmap are not as helpful as I said they would be, at any time, you can simply contact us via e-mail, and we'll issue you a prompt and courteous refund of your entire investment. P.P.S. — Know Another Literal Revelation Roadmap? Where else are you going to get a completely verifiable literal interpretation-based end times roadmap anywhere at any price? Everyone else is selling expensive allegorical roadmaps which, after reading this letter, you now understand are built on a wrong foundation which always produces error after error on the way to the inevitable wrong conclusions that always results from bad assumptions. Even worse, they charge much more than I am, $190 for a Revelation commentary or even $325 for a three level end times course! (that you already know won't deliver the solid literal answers you seek). Don't you owe it to yourself to invest in the only literal-only teaching on the Book of Revelation on the market, one that offers you a complete roadmap with events the other teachers do not even know about? Invest in your copy now, your satisfaction is guaranteed. Click Here! Speaking of investing, I ought to address an issue that comes up frequently so you are clear why it's ok for both you and I to help each other in this way..
P.P.P.S —"Profiting from God's Word"!? I understand that, for some, the prospect of seeing a price tag on Bible teachings that they want presents a dilemma. It may offend them because they believe Jesus was against anyone profiting from or "merchandising" or even selling God's word (I'm honestly not sure if that means they only have Bibles they received for free?). Or, they may be afraid they would be supporting someone who does not really love God but is simply out to shamelessly make a "quick buck" off his Word and "fleece the flock." My response to people writing me with those concerns is that Jesus himself said the "worker is worthy of his hire" (Luke 10:7). Paul also said that those who proclaim the Good News should get their living from it (1Cor 9:14). So there is nothing wrong with making a living from teaching people God's truth. It's actually good and something God set an example of in the priests of Ancient Israel. He didn't want their service at the temple to suffer from them being busy supporting their family by holding down a secular job or, worse, begging. So he set them up to be paid for their service and teaching his words and ways. Unfortunately, most Bible teachers do not follow the above Biblical precedents today, setting us all a bad unscriptural example of begging for support in God's name. But, which is really shameful, to study the Bible diligently for years and sell the resulting teaching which provides long-needed answers so well that truth-seekers will gladly pay to have it, or, to beg for your support in God's name, subtly guilting people into sending you money to "support God's work?" of often dubious authenticity? Further, my book is not God's Word because I am not claiming to be a prophet. Instead, my book contains what I believe is the first reasonable, literal explanation of what other people who did receive revelation from God (Jesus, Daniel, John, Joel, Jeremiah, etc.) were describing. It took a lot of time to research and write it and I offer it for sale to anyone who places value on both their time and mine. "Buy the Truth and Sell it Not!" Some people who want to read my book just can't get past Proverbs 23:23 which says "buy the truth and sell it not" and even write me angry letters quoting it as proof that I am not a Godly person if I charge for my writing. I understand where this idea comes from as many ministries give their materials for free citing this verse as the reason. However, there is a huge inconsistency with this view that everyone seems to miss. For, this very verse that supposedly tells you to "not sell" anything if it contains the truth, also tells you to literally "BUY the TRUTH" (from someone selling it)! You would paradoxically be enabling disobedience to scripture by obeying the very same scripture yourself! It's obvious when you think it through carefully that this proverb is figurative and not meant as a literal prohibition against anyone selling Scripture-related studies. When you check modern paraphrase translations, they say as much: "Invest in truth and wisdom, discipline and good sense, and don't part with them." (CEV). If it helps you to feel better about taking me up on my offer, you can simply think of my book as "Cliff's Notes for the Book of Revelation." I summarize Revelation's roadmap and make plain the meaning just like Cliff's Notes did for you in high school with Shakespeare's plays. The modest price of my book is a bargain when you consider that it can literally save you years of study. And, just for those concerned about this, you will not be supporting a bad cause if you do so. Remember, I was a laid-off Bible software programmer out of the country without even unemployment income when I wrote this research. Even though I was later hired back, writing Bible software does not pay very well so we're still recovering from that financial setback. Not that I'm complaining. I could have made lots of money in game programming with a high school friend of mine instead, but I preferred to use my talents to facilitate study and research of the Bible. That was my choice and I have no regrets :-). Nevertheless, I do rely on the support from this site to make up for all of this and provide for my wife and two children (who faithfully roughed it with me through that low point). Today, when people like yourself order my research, I think of it as payback for my layoff hardship (it's true how all things work together for good isn't it?). It also enables me to do more research which will be added as new chapters to my book and available as upgrades to my members. So, after reading all of this, if you still do not feel comfortable about paying for my research, then that's ok and I just want to reassure you that this has nothing to do with your eternal salvation. This research will simply help you to fulfill Jesus' command to "watch" so that you may be able to "endure until the end" and "to escape all these things that shall come to pass, and to stand before the Son of man" (Luke 21:36; Matthew 24:13). I have faith that if someone wants my book because they are seriously searching to understand prophecy and fulfill Jesus' neglected command to watch in light of prophecy, God will provide them with the funds to do so without them needing to resort to begging, either (Psalm 37:25). In conclusion, as a non-prophet without supernatural provision and commission like the apostles had, when I charge for my hard work (and refuse to beg myself or enable other's behavior of begging), I am actually upholding God's ways rather than departing from them. Neither am I preventing anyone who has faith and who trusts in God from understanding Revelation and its roadmap—as long as they diligently seek it just as I did. Do you subscribe to the pretribulation rapture as a result of your own intense and thorough personal study of the Bible directly? Or must you honestly admit that you inherited the belief without giving it due diligence because it's the only one you were taught or is it the one that most appealed to you after only a brief investigation or article on the subject? Then as life goes on we find out it's just something we always believed or assumed was true. Some even years later still do not have the ability to test theories they believe because they have not even taken the time to read the Bible all the way through once, which would be a prerequisite for having proper Biblical discernment. First, can you honestly say you know for sure that a pretrib rapture is going to save you if you have not proven it yourself, but trust that the pretrib teachers are right? Would you bet your life on it? Your life may be at stake here if it turns out you are wrong. Second, if you would admit like most that you do not understand the Book of Revelation, then how can you prove the timing of the rapture found among its framework of seals, trumpets and bowls (and thunders)? Most teachers say the Great Tribulation and Rapture begin at the first seal, but what if I told you that the only literal fit for the Great Tribulation is at the 5th trumpet, which comes after Wormwood at the 6th seal through 4th trumpet! So even if there was a pretrib rapture, it could not save you from Wormwood (just read Revelation 6:12-17 literally to see what you will be facing before even a pretrib rapture can happen). Third, if you have studied it yourself or think you do understand it, then can you say you understand it in its plain face value meaning without resorting to typology, symbolism, allegory, metaphor, etc. to make it fit? Chuck Missler is one of the top pretrib Bible prophecy teachers and he makes an honest admission often that as time goes on he has more and more discovered that when he realizes he misunderstood a Biblical passage, it was usually because he did not take it "literally enough." Is it possible that in believing a pretrib rapture that you, like Chuck, have also not yet taken the words of Jesus literally enough when he said "after the tribulation of those days" in reference to the rapture of the elect (a label for the Church used throughout the New Testament)? I strongly urge you to study my research as it will help you for the first time to see for yourself what Revelation plainly, literally says including where the rapture occurs on the complete roadmap that emerges from putting all the verses together without forcing them allegorically into a pretrib scenario. If after that you still do not see it, then I will dutifully fulfill your request for a refund. But isn't it better to be safe than sorry?